As readers of my blog may recall, I announced a “Waste No Food Challenge” on May 25th. I was fed up with my family’s blatant food wastage and felt we could and should do better. I’m aware of how this is a problem of the privileged few. I don’t want to be ungrateful for the bounty of food in my family’s life. I’ve come to realize the crux of this issue — we’re simply producing too many leftovers. There are a few foods that get better with age, such as stews and soups. But most foods just get kind of dry and crusty after a day or two in the fridge. Hardly a tempting treat. Why do we cook like army chefs? The most logical course of action with meal prep is to cook up a very large amount all at once. That way, there’s more for later and only a single clean up. It’s this exact mode of thinking that got us wasting so much food in the first place. Logic, schmogic, Spock. For my family, It’s just more food to throw out. Today I was at the grocery store comparing different packs of ground beef for hamburgers. The “family pack” was huge, but with a low per pound price. The smaller packs had a higher per pound price. My first impulse was to get the big pack because it was a better deal. Buying too much of something, so that it later gets thrown out or exiled into the Siberia of my freezer is no solution to our food wastage issues. What if I figure out how many burgers we need, and buy just that amount? Do I have leftovers from tonight? Unfortunately yes, but it’s a totally manageable amount. I’m thinking tacos for tomorrow. Are we perfect? Absolutely not . . . but we’re getting better. Leftovers get eaten here for the most part. During the school year they get packed into lunches for both myself and the kids. Now that it is summer I will eat them for breakfast. OK –red beans and rice may not be a breakfast food but it is just a filling and nutritious as it was the night before. My problem with food waste is vegetables. I wish I could just buy 3 stalks of celery or 1/2 a bunch of basil. That is the type of food that goes bad around here. I’m on board for the challenge! Our meals are a bit eratic which means for all our best intentions, we waste a lot of fresh food. And yeah, we also buy bulk for the best price but waste too much of it to be a bargain. Ugh, my food challenge is not going so well–though, I have noticed much LESS waste, but not NO waste. I need to do an update about that on my blog–thanks for the reminder! Any change is progress. Simply having the awareness about one’s own issues with food wastage will bring about change. We not perfect, and that wouldn’t be normal anyway. We’re doing our best, and getting better through attention to this issue. Buying meat in bulk and re-packaging for freezing at home is super easy. And instead of viewing your freezer as some remote Siberian wasteland, you instead manage it, and look in it daily for inspiration. The problem I have (being vegan), is wasting veggies and fruits. Cilantro is a perfect example. I can never seem to eat an entire bunch of cilantro. I buy it and always throw away whatever is left after I make one or two bowls of guacamole. The solution, I realize, would be to grow my own herbs, but I don’t have greenspace in my second floor apartment, nor even a windowsill that gets enough sun. I’ve heard the idea that singles should get together with neighbors and pool their veggies and herbs and fruits, but in our society, it’s hard to imagine this sort of freecycling ever occurring. Left-overs, a rarity at 2549 thanks to Pig Will Gobble. I think I opted for the green electricity but will check. It is amazing how much food goes wasted in this country. My daughter started working at the local cafe this summer, and her first day she came home complaining about the amount of food thrown away. I think it’s given her a better appreciation for trying to eat what we have purchased/grown at home. Another thing we can all do is consider replacing our ginormous refrigerators with smaller European under the counter models. A friend did this when he built his house. He regularly uses one, and can unplug the other when he doesn’t need it. He has a small chest freezer. 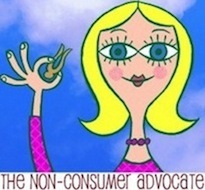 Thanks, Katy, for raising questions that force us to think about our consumer habits and choices. So much of what we know to be good, useful, healthful and right is not easy. A local family has pleged not to buy anything from China because of their record of human rights abuses. I try to eat no factory farmed meat because of how the animals are treated / taken care of. I’m trying to eat locally grown organic / biodynamic food. Less oil used in fertilizer and transport (and it universally tastes better). And I try to exercise every day (oy vey). Problem is… consistancy. I know these are the good things… but money time motivation and will foil my plans… When all else fails… “Consistancy is the hobgoblin if little minds” I tell myself. Blog on.